Havemeyer between Grand and Metropolitan Aves. Afterparty in the CR Backyard 6 – 10pm. IT’S A BLOCK PARTY FOR YOUR BICYCLE! 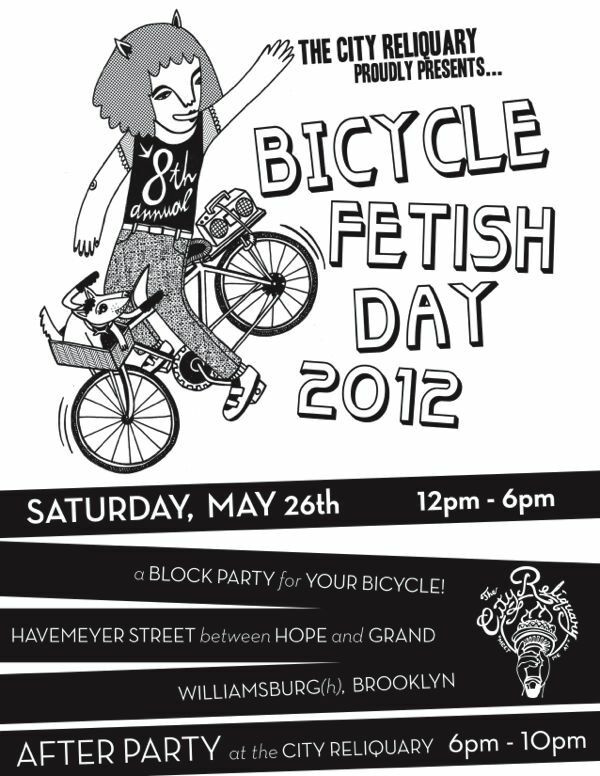 The 8th Annual Bicycle Fetish Day takes place on Havemeyer Street between Hope and Grand. Biking activities, bike competitions, bike rides, bicycle advocacy groups and artists selling their wares. With a BBQ grill and more, you couldn’t miss this yearly celebration of all things bicycle. Bring Your Bikes Because We’ve Got Prizes!!! Contests include: Best Vintage Bike, Best Shiny Bike, Best Family Bike, Best Mutant Bike, Best in Show and much more! Win great bike prizes donated by: Outlier Tailored Performance, Velo Brooklyn Bushwick Bike Shop, Affinity Cycles, and maybe, possibly, hopefully a bicycle or two. BIKENY, Transportation Alternatives, Times UP!, Taliah Lempert Bicycle Paintings, Outlier Tailored Performance, Neighbors Allied for Good Growth, Coast Cycles, Horse Cycles, Velo Brooklyn Bushwick Bike Shop, Nona Varnado, Vaya Bike Products, AND MORE. BMX tricks courtesy of POST Bike shop. AFTERPARTY @ 6PM at the City Reliquary with drinks from Brooklyn Brewery available by donation. Featuring DJ Tinsletown!